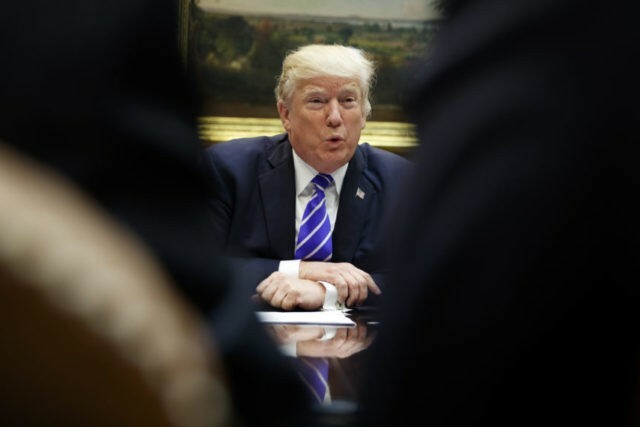 WASHINGTON (AP) — President Donald Trump and congressional Republicans are considering an income tax surcharge on the wealthy and doubling the standard deduction given to most Americans, with the GOP under pressure to overhaul the tax code after the collapse of the health care repeal. The tax overhaul plan assembled by the White House and GOP leaders, which would slash the rate for corporations, aims at the first major revamp of the tax system in three decades. It would deliver a major Trump campaign pledge. The outlines of the plan were described by GOP officials who demanded anonymity to disclose private deliberations. The plan would likely cut the tax rate for the wealthiest Americans from 39.6 percent to 35 percent. A new surcharge on wealthy taxpayers might soften the appearance of the wealthiest Americans and big corporations benefiting from generous tax cuts. Republicans already were picking at the framework, pointing up how divisions within GOP ranks can complicate efforts to overhaul taxes as has happened with the series of moves to repeal the Obama health care law. Details of the proposal crafted behind closed doors over months by top White House economic officials, GOP congressional leaders and the Republican heads of tax-writing panels in the House and Senate were set to be released Wednesday. Trump and the Republicans were putting the final touches on the plan when the Democrats were brought in. A senior Democrat saw it as the opening of negotiations. Some conservative GOP lawmakers, meanwhile, dug their heels in on the shape of the plan. The Democrats, while acknowledging the tax system should be simplified, have insisted that any tax relief should go to the middle class, not the wealthiest. Tax cuts shouldn’t add to the ballooning debt, the Democrats say. Rep. Richard Neal of Massachusetts, the top Democrat on the Ways and Means Committee, came away from the White House meeting in a negotiating mood. “This is when the process gets kicked off,” Neal told reporters at the Capitol. The rate for wealthiest taxpayers shouldn’t be reduced, he said. Democrats are concerned by indications from Trump and his officials that “they intend to offer tax relief to people at the top,” he said. Still, there may be room to negotiate over the Republicans’ insistence on repealing the estate tax, Neal indicated, since “there are other things you can do with it” to revise it short of complete elimination. Associated Press writers Ken Thomas and Matthew Daly contributed to this report.